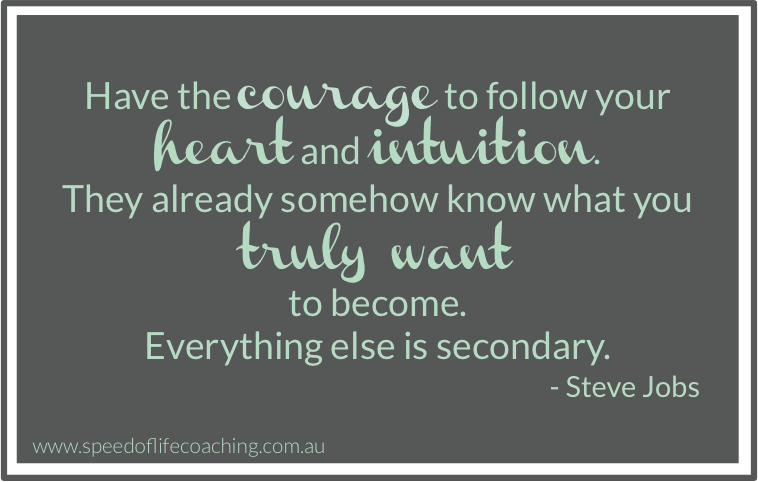 As I sat watching and listening to Steve Jobs I broke down. I was sobbing uncontrollably. I got it. I got exactly what he was talking about. About living a life, but not living a life. The pursuit of happiness and fulfillment? I was really good at what I did. I was an excellent professional, had potential plus - everyone told me, but no one would ever act on it. No matter how much I would push, and try to move myself into a position for promotion, I would find myself staring at the feet of the next person on the ‘ladder’. Even though from a leadership perspective I was more competent; it was more to do with the lack of title in my existing role. Or I wasn’t this, or I wasn’t that. Or worse still, the unspoken, I was a Mum with two kids who wanted to keep my family as a priority. It was my wakeup call - I realised how I was destroying my soul, under the illusion of pursuing what I thought was my passion. By not taking action, I was leaving myself in the same desperate place, waiting for the right time, hoping for that promotion, anticipating things would finally fall into place as others had promised. It was in that moment I knew I had to take action and I had to put myself first. It didn’t matter what anyone else thought, their perspective, their perceptions - it was no longer important. What mattered most was my happiness, my health, my fulfillment and living my own life and purpose.